As the cold, wind and snow begin to arrive, it’s time for a few winter bird feeding tips to help keep our little flying feathered friends safe and sound in the frigid weather. For a gardener, there is nothing more pleasant than the sound of chirping birds in early spring. Their beautiful songs are a signal that the long, dark, cold days of winter are at an end, and a glorious new garden season is upon us. Birds like this beautiful cardinal can use a little help to make it through winter. But in order to make it to their spring-singing show, many birds are more than grateful to get a little help in the way of extra food and shelter. Winter is tough on birds. Food is scarce, and water can be as well. The insects that were so plentiful in the spring, summer and fall have all but disappeared. So have many of the foliage, berries and other food sources that birds rely on for nutrition. And when the temperatures drop below freezing, fresh drinking water is nearly impossible to find. These two birds are happy to find a little winter grub! That’s why it’s vital to help birds out wherever and whenever we can during the winter months. Here are a few simple winter bird feeding tips to help keep your neighborhood songbirds alive and well. Braving the cold burns up a lot of calories for birds. Supplying them with a steady diet of high calorie / high fat food throughout the winter can go a long way towards keeping them warm and healthy. 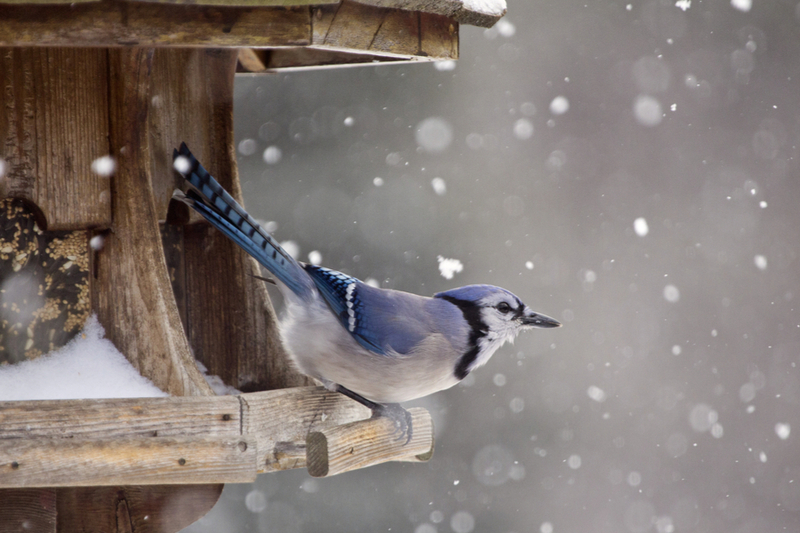 Black oil sunflower seeds, millet seed and peanuts are all excellent choices for filling bird feeders in the winter. They provide the high fat and calorie content birds need. A woodpecker nibbling from a suet feeder. And speaking of sunflower seeds, be aware that some varieties are better than others. Suet is another excellent choice for wintertime bird feeding. When feeding birds in the winter, the name of the game is consistency. Keeping feeders filled on a regular basis helps birds find a consistent food source. Birds are creatures of habit. If they know there is an available food source, they will keep coming back to it time and time again. By keeping feeders filled consistently, you give birds a reliable and safe source of food. This is especially important when the weather turns extremely cold or snowy. Don’t forget to spread a little food on the ground too! Many species of birds prefer to source food from the ground, and not from hanging bird feeders. Many species of birds prefer to scavenge for their food on the ground. Seed and feed broadcast in an open space gives these species a chance for feed as well. Having a source of fresh water is important to birds in the summer, and the winter. Filling bird baths or setting out small pans of water during daylight hours can go a long in helping birds maintain their health. Birds need protection from the harsh elements of winter. Leaving ornamental grasses up throughout the winter provides extra shelter for birds. One of the easiest ways to do this is to leave natural plant protection in place throughout the winter. Resist cutting back and pruning ornamental grasses, shrubs, bushes and other perennials until spring. This allows birds to find shelter when snow and ice have all but covered their normal nesting and resting places. Here is to keeping birds safe and sound this winter! This Is My Garden is a website created by gardeners, for those who love to garden. We publish two articles every week, 52 weeks a year. Sign up below to receive them free each week via email, and be sure to follow us on Facebook. This article may contain affiliate links.